The Learning to Learn Camp & the Student Success Institute. What benefits does this program offer? 1. A research and practice-based focus on improving students’ ability to learn. As students begin to learn how to learn, they become capable of increasing their ability to learn. 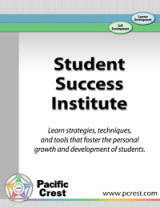 What is a Student Success Institute? The 3-day Student Success Institute is based on the premise that a key role of educators in higher education is that of a mentor who fosters a learner’s growth and the development of his or her cognitive, social, and affective skills. Success is referred to not simply in terms of academic success but rather in terms of a broad set of those skills required for success beyond college. The Student Success Institute is the best possible preparation for faculty who will be participating in a Learning to Learn Camp. The 1-day Student Success Workshop has the same focus as the longer institute, but with a reduced scope. The institute will provide strategies, techniques, and tools which foster personal growth and development of students in the context of first-year courses and learning-to-learn camps. During the institute, participants will be introduced to a variety of tools which support the philosophy of Process Education and lead to a quality first-year course. Please contact us so that we can put together a custom Learning for Success package designed to meet your specific needs.